Night of the Living Dead is a 1968 American horror movie directed by George A. Romero. It stars Duane Jones, Judith O'Dea and Karl Hardman. It premiered on October 1, 1968. It was completed on a US$114,000 budget. The film became a financial success, grossing $12 million domestically and $18 million internationally. Night of the Living Dead was heavily criticized at its release owing to explicit content. It eventually garnered critical acclaim. It was selected by the Library of Congress for preservation in the National Film Registry as a movie deemed "culturally, historically or aesthetically significant. The movie is in the public domain due to an error by the distributor. The story follows characters Ben (Duane Jones), Barbra (Judith O'Dea), and five others trapped in a lonely farmhouse in Pennsylvania which is attacked by unnamed "living dead" monsters which later became known in popular culture as zombies. 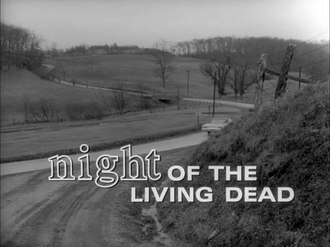 Night of the Living Dead was the basis of five Living Dead movies (1978–2010) also directed by Romero, and has inspired remakes. ↑ 1.0 1.1 1.2 J.C. Maçek III (2012-06-15). "The Zombification Family Tree: Legacy of the Living Dead". PopMatters. ↑ Boluk, Stephanie; Lenz, Wylie (August 26, 2011). "Introduction: Generation Z, the Age of Apocalypse". In Boluk, Stephanie; Lenz, Wylie. Generation Zombie: Essays on the Living Dead in Modern Culture. Jefferson, North Carolina, US: McFarland & Company. p. 5. ISBN 978-0-7864-6140-0. Retrieved August 26, 2011. Wikimedia Commons has media related to Night of the Living Dead. This page was last changed on 13 January 2019, at 16:13.